Second Draft of West North Avenue Streetscape Conceptual Master Plan Released! 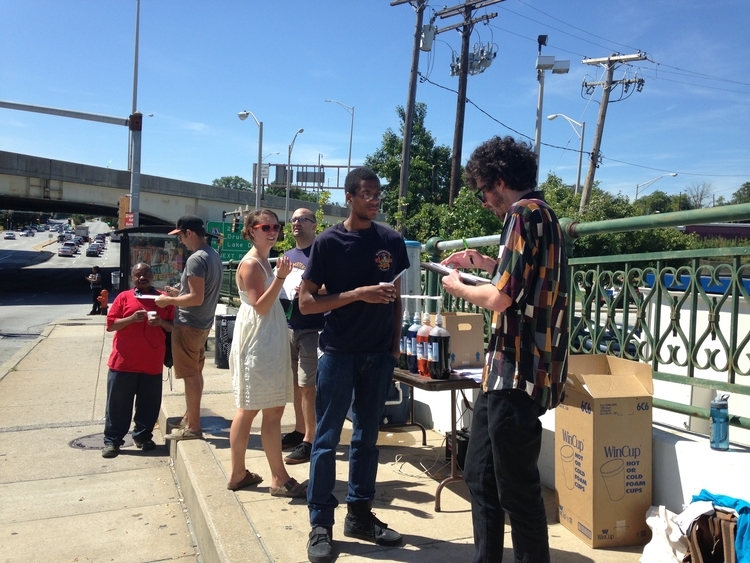 Volunteers and RHIC staff talk to passersby at the summer snowball stand about their ideas for a new West North Avenue Streetscape. We are very excited to announce that the second draft of the West North Avenue Streetscape Conceptual Master Plan has been released. More than 600 residents and supporters have given input into the design. Thank you one and all! The Near West North Avenue Task Force is reviewing the draft, and we have requested comments on the draft from Baltimore City Department of Transportation and other city agencies by 12 January 2015. A public meeting to review and discuss the draft will be scheduled in January 2015. Watch for notices. Your ideas are very important to ensuring we transform North Avenue into a safe, beautiful, welcoming connector of our communities. You can download the draft by clicking here, and the appendix to the draft by clicking here. For background on the project, click here. To offer comments or discuss the project, contact Rick Gwynallen at 410.225.7547, or by email at rgwynallen@reservoirhill.net.